Appreciation of the Korean culture and continue what I have started ―these are the things that I have in mind when I enrolled in the Korean Cultural Center in the Philippines. In college, I got a chance to be admitted in a pilot Korean language program that my school introduced in partnership with a renowned university in Korea. But unfortunately, the program did not pursue well and we did not finish the entire language course, that’s why I can’t help but grab another opportunity to learn one of the most effective languages in the world before the chance slips away. My attempt to learn the Korean language for the second time has been one of the most rewarding parts of venturing something different after college. But before I share my journey in this new, exciting experience, let me first introduce you to what is Hangeul all about. 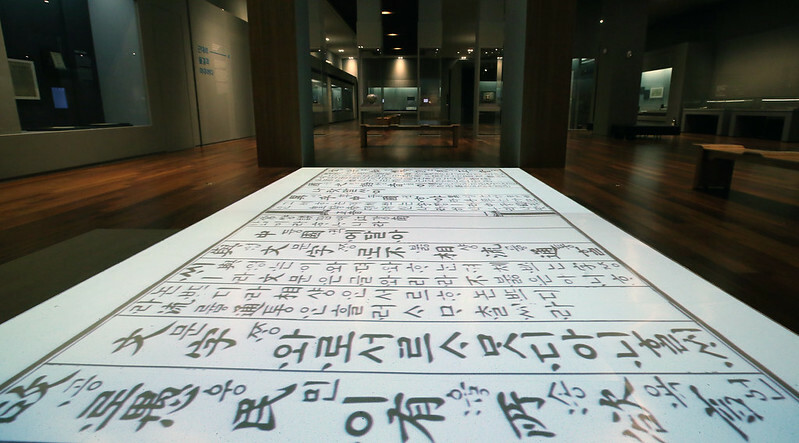 Hangeul is a unique phonetic writing system and the official language of the Korean peninsula. It was created under the reign of King Sejong the Great during the Joseon Dynasty in 1446. It is considered as one of the most efficient alphabets in the world because of its scientific basis and design. And today, about 80 million people speak the Korean language worldwide. 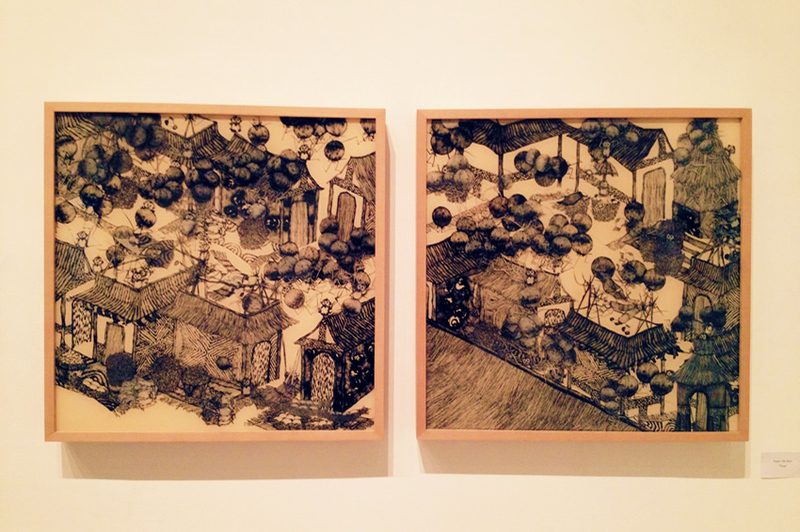 Art exhibition in the National Hangeul Museum of Korea. Flickr image courtesy of the Republic of Korea. 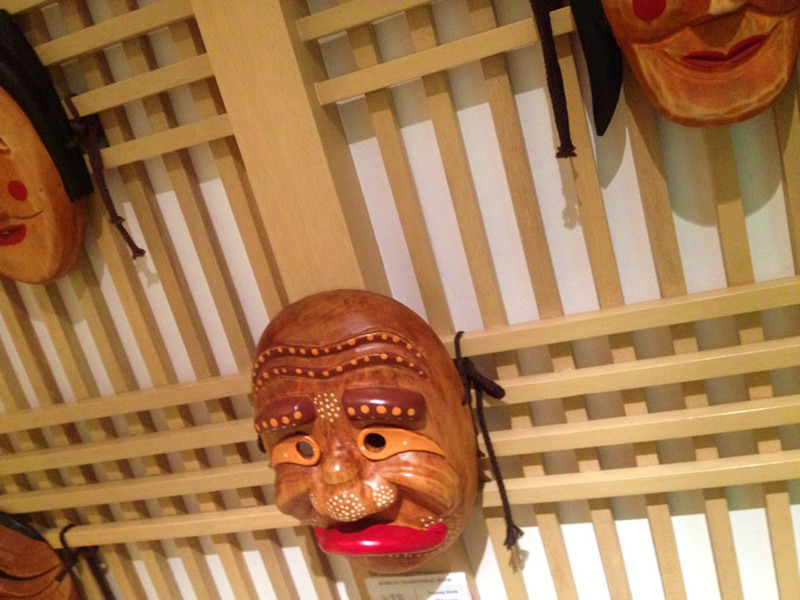 Korean masks (탈) art installation that you can see inside the Korean Cultural Center. Before I studied Hangeul in the center, I already have a background on how to write and read the alphabet but only a few Korean phrases I do understand and speak well. The first day of class can be fun, amazing as well as disappointing, and in my case it always makes me nervous. Shyness is really normal for people and I am too sure it was not just me who’s always frightened to come out of my chair and introduce myself to others every the first day of school. When you enroll in a KCC class, you will come across new faces and different personalities in a unique learning setting. The books that we use are designed for beginners and adult learners who want to learn and improve their Korean communication skills in a short period of time. All of the references are from the respected language institutes and universities of Korea. The vocabulary, grammar, expressions and activities contained within both the textbook and workbook are derived from everyday life situations so learning the language is as easy as one, two, and three. 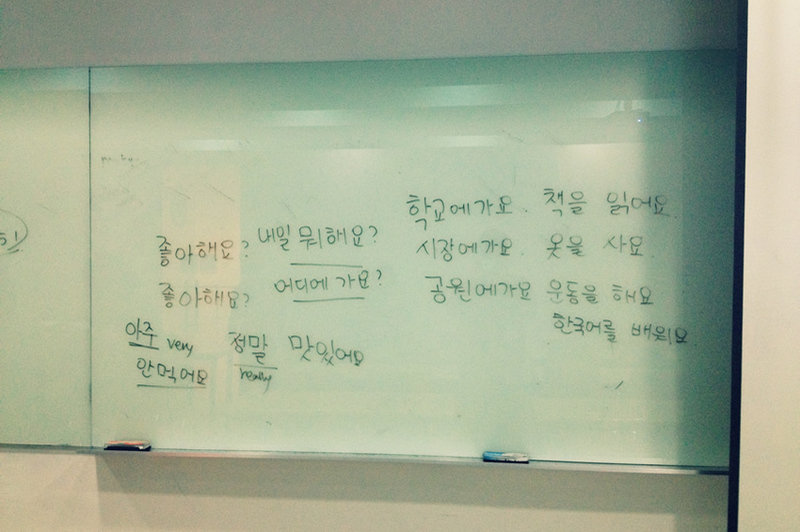 To tell you, on our first class meetup, my classmates already learned how to read and write almost all of the basic characters ―that’s how really efficient the Korean language is. 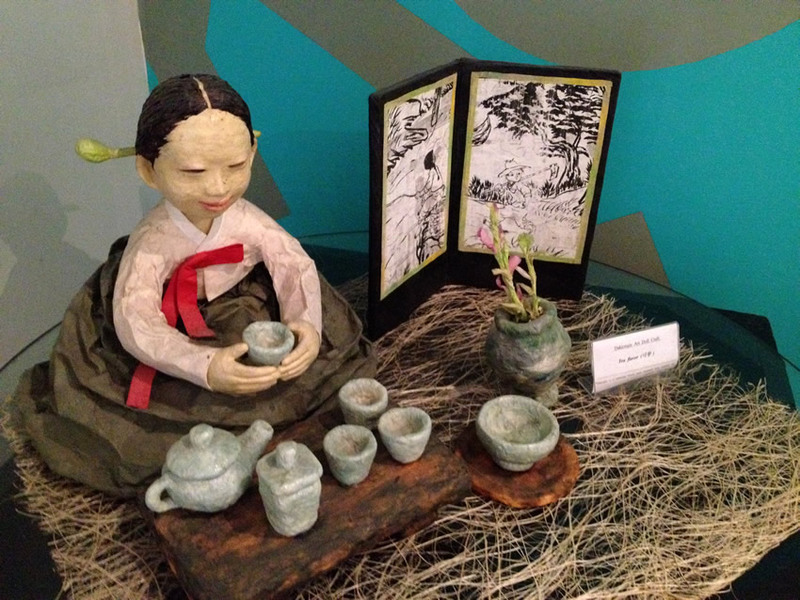 Traditional Korean dakjongie (닥종이) paper art doll beautifully set up at the lobby area of KCC. Towards the learning process, it’s not just about the language that we will be able to learn but also the rich history and cultural diversity of Korea including its world–renowned food, hip music, advanced technology, great tradition and the welcoming people. While some already chased the shyness away, still I was stuck to only few new friends though each week and I was looking forward to knowing the others as well as the cluster of interesting activities prepared for the lesson. Sometimes the activities were quite overwhelming most especially the tasks, games and conversation drills in which we all participated and did in front of the class as the one illustrated in the book. Even if most of us were too shy, we surely enjoyed the exchange of dialogues and every lesson necessary for us to effectively learn the language. 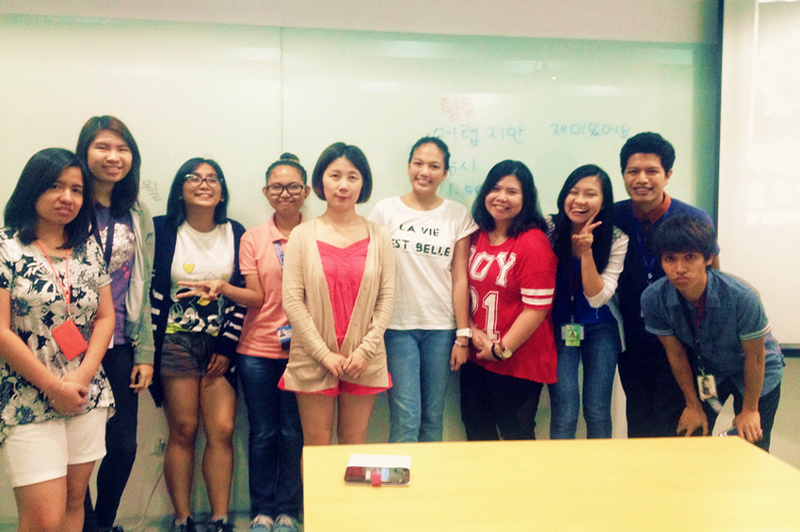 One of the few class pictures we had with Teacher Ellen Cho. The language class is not about being too serious but just like the culture class it is the enjoyment of learning. They say it’s kind of boring but not with what I have experienced. We do really have an amazing classroom setting for our section, we took part in all the instructed activities and our teacher had something for us each week to entertain and learn new things about Korea. We even laughed in agreement when someone made a mistake in their dialogues, not to mention the 15-minute break dedicated to playing the class’ favorite K-pop song and teacher will do the demo dance for us. Who said that language class isn’t entertaining? As exciting as the class syllabus, there are also events hosted by the Korean Cultural Center that you can partake in and attend to. While enrolled in a class, you get to enjoy as well various events that showcase the culture and tradition of Korea and everything about the programs offered by the center. It’s cool that while you are learning to be fluent in using the Korean language, you will also enjoy what Korea has to offer the Filipino community and the entire globe as whole. 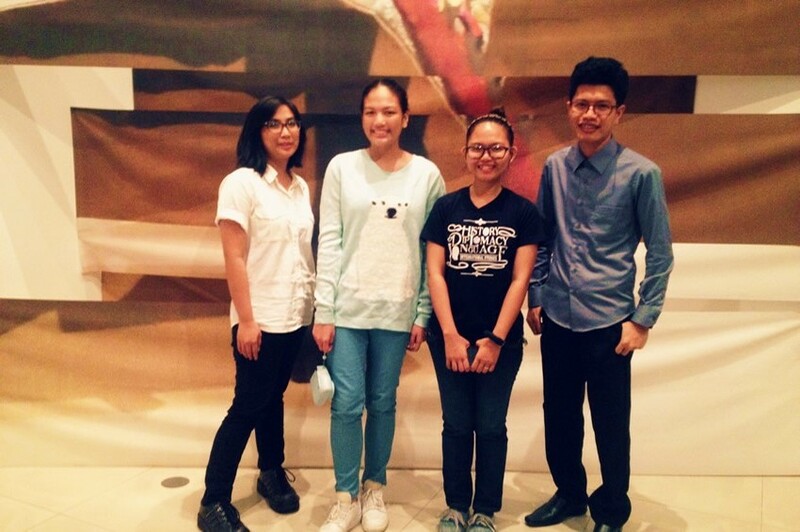 KCC recently held the Korean Speech Contest, Quiz on Korea, Global Taste of Korea and the Pinoy K-pop Star which was graced by a huge number of hallyu fans and enthusiasts. Also, the much–awaited major events set for this coming months such as the Korean Film Festival and Phil-Korea Exchange Festival which promise a more thrilling line up of activities. Moreover, there is an ongoing “Old & New” art exhibition portraying interpretations of the past and the present that you can visit and experience for free until September 25 of this year. What more can you ask for? 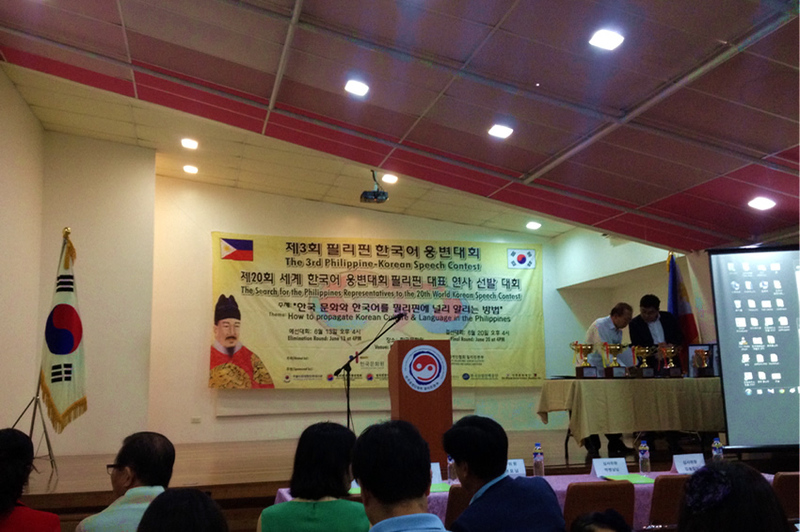 The Philippine–Korean Speech Contest held at the Korean Cultural Center, one of the interesting events that I and my classmates attended right after our language class. 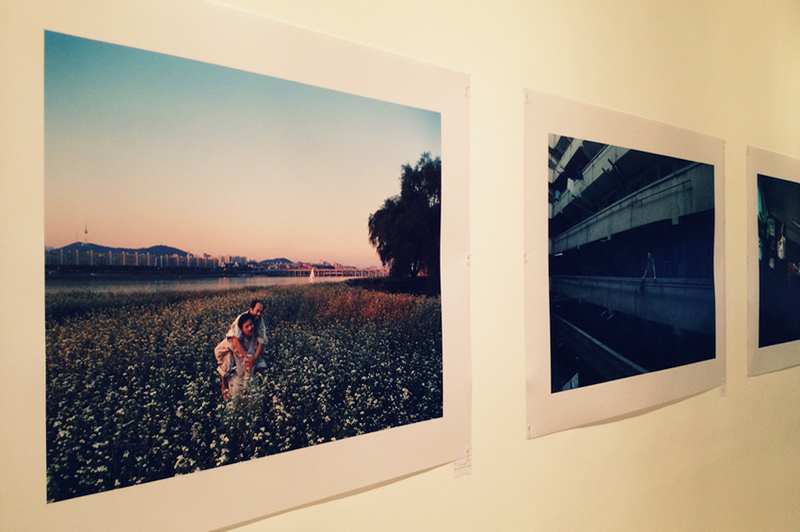 In addition to photography by Yoon Jeong Mee, illustration, painting and installation arts are also featured in the “Old & New” art exhibit. In KCC, it’s for sure they will have your Korean Wave passions cover. Just like the privileges that I have enjoyed during my stay in the center such as free library membership for a three-month class term in which you get to delight in various Korean media collection from books and journals, to K-pop CDs, K-drama series and K-movies along with exclusive event invitations to name a few. 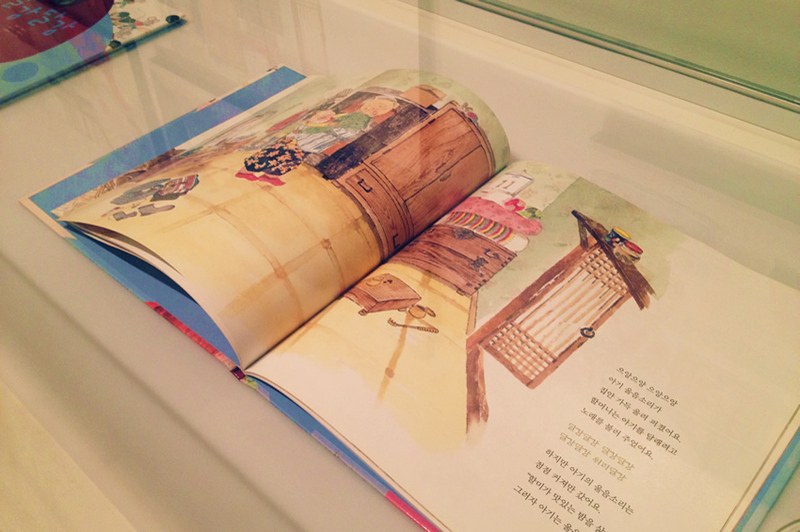 “Dalgang–dalgang” ink and color on paper illustrations by Lee Jung Eun is part of a Korean children’s book exhibited at the cultural center. Are you asking for exam and quizzes? Of course, even though it’s only a basic language class, we also had an exam after the 9-unit lessons aside from the workbook assignments after each session. The final examination served as an assessment of the 12-week course and also to determine who the best students in each class are. For me, I considered it a quite tough exam, for it was my first to see an answer sheet that almost all of the writings are in pure Korean, but at least I scored beyond half the total and I am glad I passed the evaluation. As for the elementary and intermediate class, I am sure they too have made several quizzes and also the final examination after the short-term course but unlike the basic class, a grade of 70% is required to pass the language course. After completing the course, we also had a class graduation wherein all of the class sections present their best and showcased live and video presentation showing what we have learned including the fruits of our hardwork. All of the classes did well in their performances and it is said that every year it’s becoming more and more interesting and engaging compare to previous class terms. 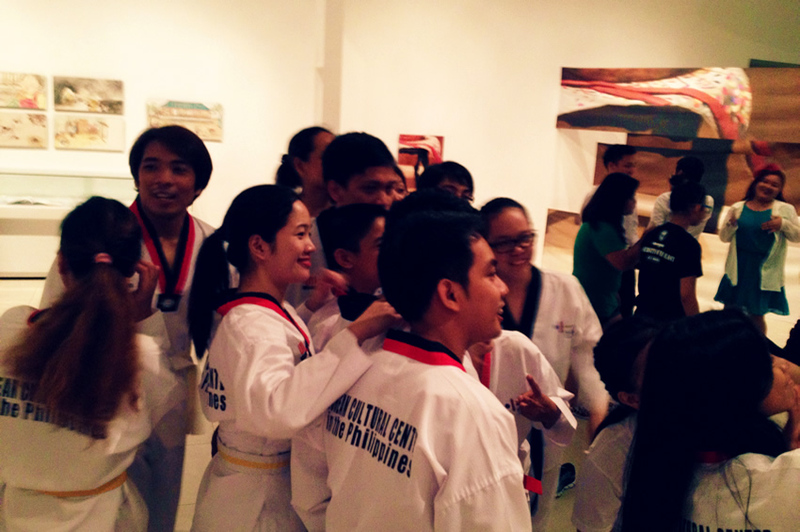 The taekwondo (태권도) team won first place in their presentation during the culture class graduation. In my three months of study in the center, it’s not just about the knowledge that I got but a whole new experience and the friendship made. Through the hardwork that I’ve been to in learning the foreign language and my teacher’s patience in teaching us, it’s great to see that it has paid off. I can now write the Hangeul alphabet confidently, read and speak Korean a little bit faster than before, construct grammatically correct sentences as well as understand more phrases and expressions in Korean. I am really thankful for this opportunity, most especially to my teacher and classmates that learning the Korean language with them has been a fun, more effective and an exciting journey. 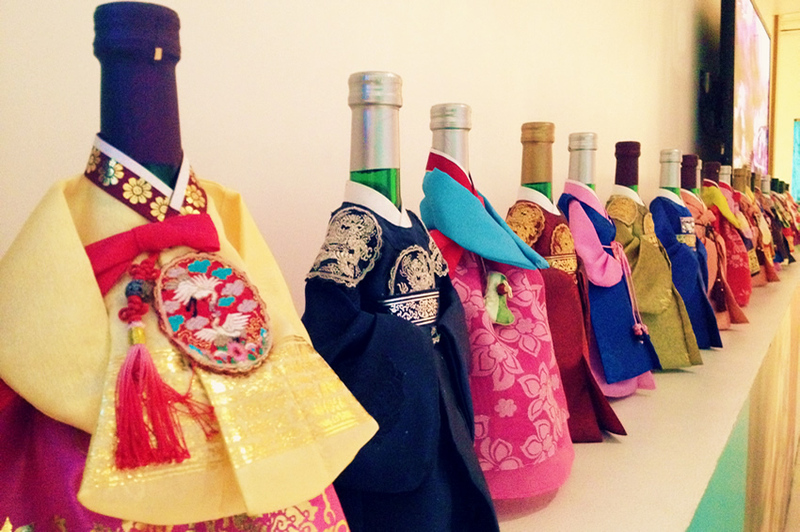 These bottles wearing the traditional Korean dress hanbok (한복) are the cutest. 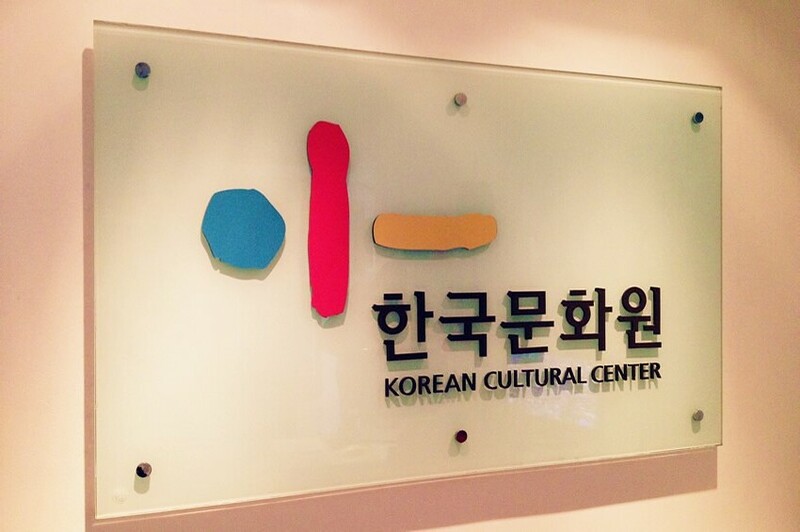 This September, the Korean Cultural Center in the Philippines will be opening its 3rd term for this year. The language class still includes the Basic Korean, Korean Elementary 1 & 2, Intermediate Korean and a Special Pilot Language Program for those who successfully passed the E2 course. Aside from a bunch of language classes offered this coming last term, the center will once again admit students for the K-pop Dance, Korean Singing, Traditional Dance, Hansik and Taekwondo as well as the new Gayageum, Nanta and Samulnori classes. 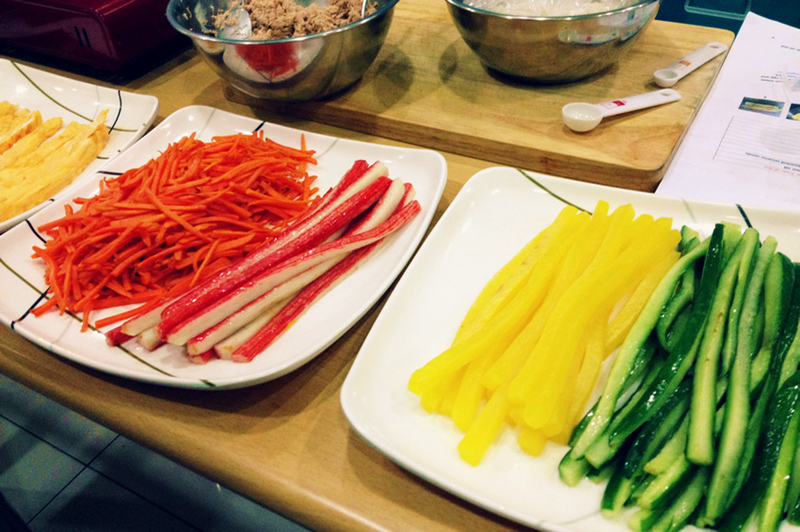 Hansik (한식) is all about organic, lots of greens and brightly colored vegetables. I am inviting everyone to take this great opportunity to learn not only the Korean language but also learn the Korean culture. Who knows, we might be classmates in one of these classes?